There are numerous benefits of setting up an equilibrium system. Since these free-flow systems do not require a float-valve, they tend to be easy to maintain, dependable and freeze resistant. This is especially helpful if the catchment system is located in a remote area. The basic concept is very simple. Equal Tank Depth & Equal Elevation. Your storage tanks and drinker should be at the same elevation and the tanks are all the same depth. If this is the case, the water level will naturally equalize between all the tanks without a float-valve. Tip. It’s helpful to use a supply line that is 2” in diameter or greater that tend to be more resistant to freezing than a small line. Upon request, we can include an 2” bulkhead fitting on the Drinker-310. 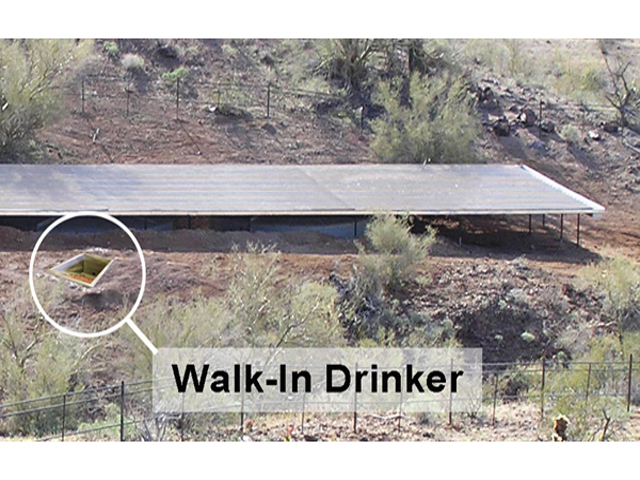 The Walk-in Drinker comes standard with a 3" bulkhead fitting. Consider insulating the supply line and burying it underground for extra protection from freezing, trampling, and gnawing by critters. Equilibrium systems are scalable in size and commonly range between 1,000 and 24,000 gallons. The storage tanks can be located directly under the collection roof system which allows the rainwater to gravity feeds directly into the tanks. The roof also helps to conceal the tanks and provides extra protection from UV and freezing. In the example shown above, the Drinker-310 has a depth of 26”, so you would also want to use a storage tank(s) of similar height.